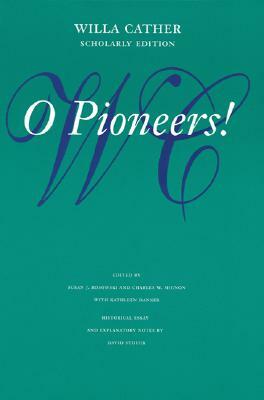 Willa Cather said that O Pioneers! was her first authentic novel, “the first time I walked off on my own feet—everything before was half real and half an imitation of writers whom I admired.” Cather’s novel of life on the Nebraska frontier established her reputation as a writer of great note and marked a significant turning point in her artistic development. No longer would she let literary convention guide the form of her writing; the materials themselves would dictate the structure. The paperback edition contains all the text and scholarly apparatus found in the original Willa Cather Scholarly Edition. Edited according to standards set by the Committee for Scholarly Editions of the Modern Language Association, this volume presents the full range of biographical, historical, and textual information on the novel. Susan J. Rosowski (1942-2004). Charles W. Mignon is professor emeritus of English at the University of Nebraska–Lincoln. Kathleen Danker is an assistant professor of English at South Dakota State University. David Stouck is a professor of English at Simon Fraser University.